Centers for Disease Control and Prevention (CDC) Fetal Alcohol Syndrome - Facts; questions and answers; treatment options; data and statistics; research; articles; outreach materials; links; and more. FASCETS - The Fetal Alcohol Syndrome Consultation, Education and Training Services, Inc., is a non-profit organization that has resources, articles, books (Trying Differently Rather Than Harder), and more. FAS Diagnostic & Prevention Network (FAS DPN) - Washington state network of clinics with information, training, professional articles, diagnostic codes, links, and more on FAS. March of Dimes - Information about preventing birth defects and having healthy babies. National Institute for Alcohol Abuse and Alcoholism (NIAAA) - News and events; publications; research; clinical trials; links; and more. National Organization on Fetal Alcohol Syndrome (NOFAS) - Sections for families, professionals, educators and others that contain information about FASD; financial and other support services; professional education and patient education materials; advocacy information and events; special education information and resources; Circle of Hope (Birth Mother's Network); Hall of Fame (Barbara and Rob Wybrecht) and more. SAMHSA FASD Center for Excellence - FASD information, publications, training, links and more from the National Center. 211 Information and Referral Center - Find local community services online or dial 211 to talk to an operator. Allies With Families - Empowering families with voice, access and ownership. They offer real life experience, practical resources and training for parents as advocates. For more information, call 801-433-2595 or toll-free 877-477-0764. Baby Your Baby - Find financial help during pregnancy and information to help you have a healthy pregnancy. Children with Special Health Care Needs - Clinics with screening and diagnostic services for children with developmental delays and chronic conditions. Church of Jesus Christ of Latter-Day Saints Disability Resources - Information about disabilities, information for families, accessible materials, and more for families with children with disabilities. Davis Family Advocate Program - Provides case management, outreach, and referrals. Call 801-776-0054 or after hours 801-773-7060. Disability Law Center - Helps to enforce and strengthen laws that protect the opportunities, choices and legal rights of people with disabilities in Utah. For more information, call 801-363-1347 or toll-free 800-662-9080. Division of Services for People with Disability (DSPD) - Promote opportunities and provide support for persons with disabilities to lead self-determined lives. Support includes community living, day services, supported employment services, and support for people with disabilities and their families. Family to Family Network - A grassroots volunteer group composed of family members across Utah who have a relative with a disability. Their mission is to educate, strengthen and support families of persons with disabilities. For more information, call 801-272-1051 or toll-free 800-468-1160. F.I.R.S.T. Prenatal Support Program - For information, call 801-565-6972. Help Me Grow Utah - Free information line for parents to help them find community resoruces and learn about health development for young children. Free developmental screenings are provided. More information is provided on the Help Me Grow Blog and at the Help Me Grow National Center. House of Hope - Formerly the Utah Alcoholism Foundation, this organization provides treatment and other services for women, children, and families including parenting skills education, individualized treatment, vocational training, and more. NAMI Utah - The National Alliance on Mental Illness, Utah Chapter’s mission is to ensure the dignity and improve the lives of those who live with mental illness and their families through support, education and advocacy. For more information, call 801-323-9900. Parents Empowered - This media and education campaign works to prevent underage drinking in Utah by providing parents with infomation. The Utah Department of Alcoholic Beverage Control partners with state agencies and many other groups including local substance abuse and mental health providers. Pregnancy Risk Line / MotherToBaby UT - This free, private, and easy-to-use information service answers questions about medicines, drugs, chemicals, and other environmental exposures, during pregnancy and breastfeeding, that can potentially harm an embryo, fetus, or infant. Supportive Education For Children of Addicted Parents (SECAP) - Brochure with information about a free program from Weber Human Services with sessions for youth, teens, and adults. Treatment Providers - The Division of Substance Abuse and Mental Health (DSAMH) in Utah has a locator map to help families find a local treatment provider. Utah Family Voices - Provides support for families of children with disabilities and is run by parents of special needs children. Support services includes fact sheets, support groups, training, care notebooks, conferences, listserv, and more. For more information, call 801-584-8236. Utah Newborn Safe Haven - Provides information about the Utah law that allows the safe relinquishment of newborns by the mother to a 24 hour hospital. Also has a hotline telephone number for questions and list of local hospitals. Utah Parent Center - Resources for parents of children with disabilities in Utah including the FASD e-Journal, resoruces for working with schools, and more. 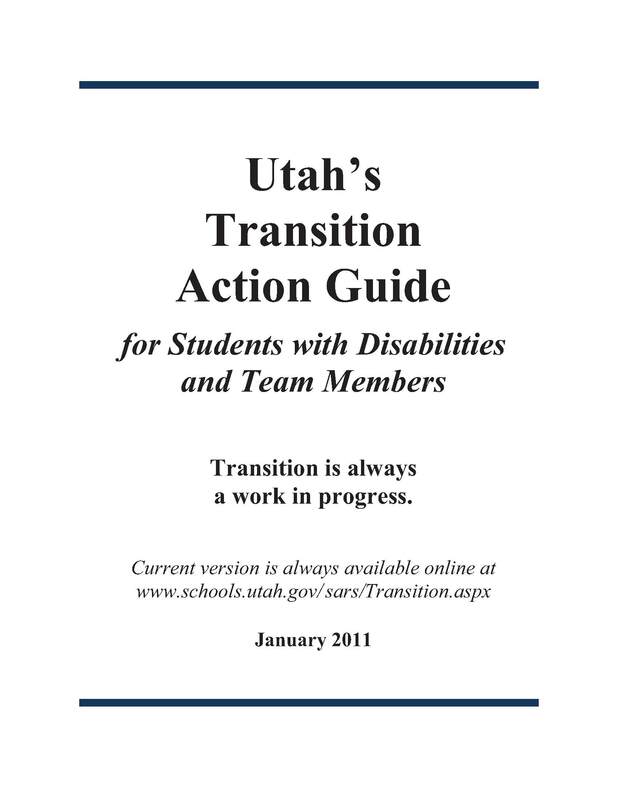 Utah's Transition Action Guide - Roles, expectations, and responsibilities for transition (from school to adulthood) team members and agencies including information about requriements under Utah's special education law. Vocational Rehabilitation - Assists eligible individuals in obtaining employment and increasing their independence. Weber/Morgan County Substance Abuse Treatment - For information, call Weber Human Services at 801-778-6811 or 801-625-3700. Work Ability Utah - Creates a comprehensive, consumer-responsive system of work supports that increases employment outcomes for individuals with disabilities in Utah. Wright's Law - Provides information about special education law, education law, and advocacy for children with disabilities. Best Drug Rehabilitation - A Michigan treatment center for substance abuse. The website includes information about forms of addiction, treatment methods, intervention, and other resoruces. Stepping Stone Center for Recovery - A Florida treatment center for substance abuse. The website includes information about FAS, drug and alcohol rehabilitation; dual diagnosis treatment; and other resoruces. The Arc of the United States of America - An organization of and for people with disabilities; provides links to local chapters, news, advocacy information, and more. The Birth Mother Network - Supported by the FASD Center and NOFAS, this organization provides support for birth families affected by FASD. CDC, Fetal Alcohol Spectrum Disorders - Provides information about FASD signs, links to interviews with families, and links for more resources. Center for Behavioral Teratology at San Diego State University - A research project that offers free neuropsychological testing for children between the ages of 6 months and 16 years old, prenatally exposed to alcohol and/or drugs. Call 619-594-1228. Drug Rehab Guide - Provided by the Hills Treatment Center, a private organization, the guide has information about common concerns and questions for drug treatment. FAS Arizona - Tha Arizona webstie has information, event postings, news, resources, and more. FAS Aware UK - Information and support resources. FAS Community Resource Center - Teresa Kellerman an adoptive mother has quite a few things for children of all ages and adults. Fetal Alcohol Syndrome Family Resource Institute - Provides articles, information about FAS, event listings, and more. SAMHSA Fetal Alcohol Spectrum Disorders (FASD) Center for Excellence - FASD is an umbrella term describing the range of effects that can occur in an individual whose mother drank alcohol during pregnancy. Strategies for Addressing FASD - A chart that lists challenges, across the lifespan, for individuals with FASD and strategies to help address those challenges The chart can also be found at the National Abandoned Infants Assistance Resource Center. Strategies for Addressing FASD Birth To Three - A chart that lists challenges for young children and strategies to address them. Treatment4Addictions.com - A website with links to treatment centers, drug information, treatment information, articles, blogs, and more. See the articles on the teen brain and adventure therapy. Division of Medical Genetics - For diagnosis and treatment of children with FAS or FASD, contact the University of Utah, 801-581-8943. Neurobehavior HOME Program - A coordinated health care model to meet the medical and mental health needs of people with developmental disabilities, part of the University of Utah Health Care system. Drinking and Reproductive Health: A Fetal Alcohol Spectrum Disorders Prevention Tool Kit - The kit includes a CD that aims to teach women's health care providers how to screen and advise all patients of reproductive age about risky drinking. Contains information about screening, education, counseling, and more. Continuing medical education credits are available. Ordering information is available. Fetal Alcohol Forum - Newsletters for professionals that addresse research and medical issues. Fetal Alcohol Spectrum Guidelines for Referral and Diagnosis - These guidelines are intended to assist physicians and allied health professionals in the timely identification, referral, and diagnosis of persons with fetal alcohol syndrome. Fetal Alcohol Spectrum Disorders Toolkit - From the American Academy of Pediatrics, these materials are designed for the primary care provider (medical home) with information about initial steps, referrals, and management including coordinating care with community services. Reach to Teach: Educating Elementary and Middle School Children with Fetal Alcohol Spectrum Disorders - This 60-page document from SAMHSA is a resource for parents and teachers and includes an introduction to FASD and tools to enhance communication. Tools for Success Curriculum: Working with Youth and FASD in the Juvenile Justice System - This 534-page document is a training to help identify needs and to develop intervention strategies. FASD Center at SAMHSA - The Substance Abuse and Mental Health Services Administration (SAMHSA) provides publications, data resources, training materials, event information, links to state organizations, and much more. Drinking and Reproductive Health: A Fetal Alcohol Spectrum Disorders Prevention Tool Kit - Continuing education for providers that provides a FASD overview, screening guidelines, FAQs, contraception information, resources, and more including a CD. From the American College of Obstetricians and Gynecologists and the CDC. Fetal Alcohol Syndrome: Guidelines for Referral and Diagnosis - These guidelines are intended to assist physicians and allied health professionals in the timely identification, referral, and diagnosis of persons with fetal alcohol syndrome. From the CDC and National Task Force on Fetal Alcohol Syndrome and Fetal Alcohol Effect. Fetal Alcohol Syndrome: A Parents Guide to Caring for a Child Diagnosed with FAS - A 40-page document with an overview of FAS, early intervention information, school issues information, IEP helpful hints, and more. FASD Region 6 - Strategies Not Solutions - A 60-page document with practical strategies for all ages and information for parents about caring for a child with FASD including environment, structure, sensory dysfunction, discipline, impulse control, communication, money, calming techniques, the criminal justice system, eating, sleeping, self care, self harming, and more. Falgren Eriksen H.L., et al. The effects of low to moderate prenatal alcohol exposure in early pregnancy on IQ in 5-year-old children. (2012); BJOG, June 20, Epub ahead of print. Kesmodel U., Bertrand J., et al. The effect of different alcohol drinking patterns in early to mid pregnancy on the child's intelligence, attention, and executive function. (2012); BJOG, June 20, Epub ahead of print. Kesmodel U., Eriksen H.L., et al. The effect of alcohol binge drinking in early pregnancy on general intelligence in children. (2012); BJOG, June 20, Epub ahead of print. Malbin D. (2002). Trying Differently Rather Than Harder. FASCETS. Skogerbo A., et al. The effects of low to moderate alcohol consumption and binge drinking in early pregnancy on executive function in 5-year-old children. (2012); BJOG, June 20, Epub ahead of print. Streissguth, A. (2011). Fetal Alcohol Syndrome: A Guide For Families and Communities. Baltimore: Brookes Publishing. Underbjerg M., et al. The effects of low to moderate alcohol consumption and binge drinking in early pregnancy on selective and sustained attention in 5-year-old children. (2012); BJOG, June 20, Epub ahead of print. Watson E., Finklestein N., Gurewich D., & Morse, B. The feasibility of screening for fetal alcohol spectrum disorders risk in early intervention settings: A pilot study of systems change. (2011); Infants and Young Children, 24(2): 193-206. Melissa - Birth mother of a child with FASD: One parent's experience with FASD. IHHP - Batchelor - Raise Awareness FASD: Video of students singing a song to raise awareness about Fetal Alcohol Spectrum Disorders. MotherToBaby: Alcohol in Pregnancy : Video with brief information about Fetal Alcohol Spectrum Disorders.